Andrew, here are some thoughts in case they help. I’m fairly new to the site and don’t know if Dan ever replies. A government program that hands a poor person $100 has obviously made them less poor. Duh. Dan is not saying otherwise. His point is that the official US poverty rate declined sharply in the decades before the 1960’s Great Society programs began, but has stagnated in the 11-15% range ever since. The official definition of poverty excludes many government programs, so what this really suggests is that bigger government has halted progress toward self-sufficiency among the poor. On the second point, I don’t think your guy understands what Dan means. Dan is saying that any government anti-poverty program is rooted in coercion because it is funded by forced taxation. We may agree that we want government to do some anti-poverty spending, but that does not make it generous or compassionate. True generosity and compassion can only come from voluntary donations like charity. It is NOT generous or compassionate for Ann to reach into Bob’s pocket, steal $100, and give that to Charley. Ann can only be generous with her own money. I think Dan knows his stuff, and you can trust what he says. The author notes the poverty rate in the article and says that government redistribution doesn’t reduce poverty. This isn’t true. Taxes and transfers play a huge role in reducing poverty. Here is a chart from a few years back as well as a link to the most recent data (http://stats.oecd.org/Index.aspx?DatasetCode=IDD). 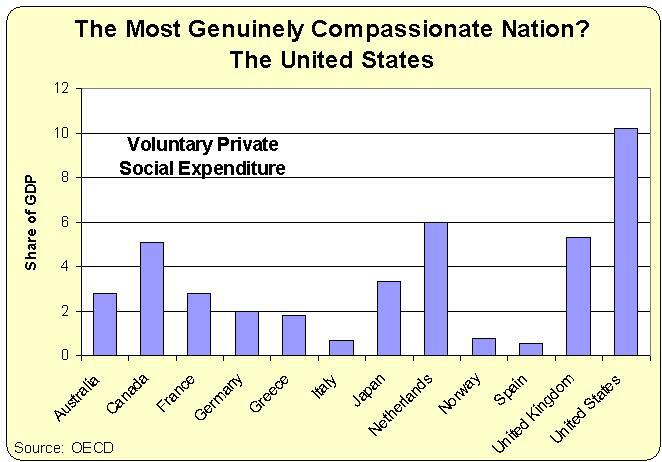 He also says that voluntary private social expenditure is the only viable measure for generosity and compassion. That’s pure unmitigated crap. Any realistic factor for a society’s level of compassion ought to be based on how that society treats the least fortunate amongst them. Clearly, the US has failed to meet this test as well as other countries. Pensions and health plans would obviously cover most of this. But that is not charity, it is “benefits” in lieu of salary and benefits that are usually tax exempt. Were it not for the military power and leadership maintained by the US at titanic expense, Europeans would be contentedly enjoying their steadily rising chocolate rations. If you ask a liberal, they would claim that they are more compassionate than conservatives. This would not be entirely accurate. Joseph Marcucilli Beware of Malignant Envy. Trace it, face it and erase it or your hatred and rage will consume you. Meanwhile — and by any measure — Americans and America are three or four or five times more generous to those in need than are any other peoples or nations. Lee Reynolds: — Comparing government to the Mob is decidedly unfair! Your Gordon Gecko argument that greed is good may be true for butchers and bakers because they produce something we want or need.Wall Street pushes paper, deals in default swaps derivatives and financial institutions too big to fail that brought down the entire economy.I think the Adam Smith quote will satisfy your readers because they are trapped in the Ayn Rand ideological crap but history is history and you glossed over the crash of 2008. Statistics are based the criteria we use.If I have one dollar to my name and give 10 cents to charity that is 10% of my total wealth?If you look at the total wealth of America to the amount given it is far less than most countries. Hi, There is actually a cause to be made for government charity. Not everybody is born with all the necessary capabilities to survive or thrive in modern society. Yes, he can wait for personal (family) charity to kick in and I’m sure this is what happens in the States more than in Europe. But, as a system, we can also describe situations where the government should take care. I agree that this directly competes with genuine compassionate charity. in Europe we have choosen to be as “inclusive” as possible: as few as possible people should be left out, even if this means that quite a few not-needing people take advantage of the system. I do believe that looking at data regarding “left-outs”, that we will see Europe performing better than the US. For the rest, excellent article, interesting point of view and certainly agree on the effects of collective charity on personal charity. Liberals can be hypocrites at times. This reflects the diference between real compassion, and phony leftist compassion. 1. Done with your own money and time, voluntarily donated. 2. The person donating the money and time decides where it goes. 3. The person receiving the help knows it is charity and says thank you. 4. The person donating expects no tangible reward, beyond feeling good, maybe getting some praise for their generosity, and perhaps receiving blessings from God. 1. Done with taxpayers money, forcib;ly extracted. 2. Politicians and burocrats decides where it goes. 3. The person getting the help fells entitled, not thankful. 4. The politicians get rewarded with votes, and the burocrats get cushy jobs. The importance of redistribution to the redistributionist arises, not through the act of charity, nor through the betterment of the receiver, but from the redistributionist wresting away control of the actual (involuntary) giver’s wealth. Capitalism rewards the successful capitalist. The committed redistributionist finds it unfair that the crass ability to make money is rewarded with power and influence in our society while “proper social outlook” is under-appreciated. Knowing fully that “proper social outlook” ought to guarantee his place as one of humanity’s leaders, but resenting that it hasn’t worked that way, the redistributionist seeks to wrest away that power by taking control of the crass wealth that others of lesser intellect seem to value. Not surprising. Once government becomes the supreme arbiter of morality, the individual no longer feels guilty about being selfish, nor do they feel obliged to take personal action when it comes to helping others. Great piece – Great subject – Greatest-ever Nation! The media and the lefties worship the Euros because they are closer to outright collectivism than we are. Every time I hear some lefty wanting to use the power of the state to enslave productive people, I’m reminded of the mob and their use of extortion and violence to extract money from businesses in on their turf in the form of the “mob tax.” I don’t see a difference, except in scale. Government so corrupted is no longer merely illegitimate, but is in fact a criminal enterprise and should be treated accordingly. “Government charity” is an oxymoron, hypocracy, crutch and bribe. The “giver” (taxpayer) feels exploited, the receiver feels entitled, and neither feels “uplifted.” Real charity is personal, preferably face to face, inspiring both giver and receiver, growing a stronger, more loving, peaceful and productive society. Big government advocates hate real charity because it empowers individualism, lessens dependency, and weakens their grip on political power. Dan — Thanks for a terrific post. This theme needs to be kept in the foreground, and it’s nice to have some neutral statistics with which to do that.